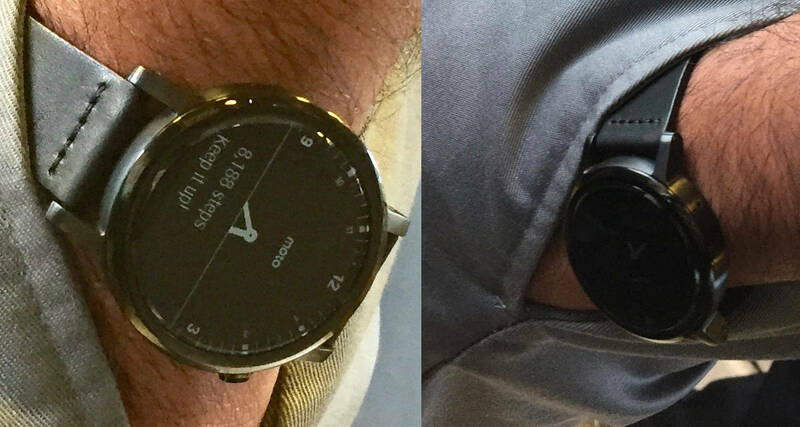 Check out the first images with the new Moto 360! You are here: GeekSays Technology News » Smartwatch News » Moto News » Check out the first images with the new Moto 360! A few days ago we were talking about Motorola’s plans to release two versions of the new Moto 360, with different display sizes, according to some details spotted on the Brazilian’s FCC website. Like we said, it was just a matter of time until the first images with the actual smartwatch would make the rounds online. What’s that on those wrists? According to Engadget, Motorola isn’t that good at keeping secrets, as a few of their employees were spotted wearing the new Moto 360 out in the open, just enough for us to take a quick look at it. Not to mention that this also confirms some leaks and rumors. First of all, we can observe some design changes. Unlike the first generation, the new model has some pretty big lugs, making it look way more like a traditional watch. Also, the wake button is placed at 2 o’clock, instead of three. As for one of the biggest design issues of the new Moto 360, in our opinion and not only, the black bar from the bottom of the display…well, it looks like it’s still there. Basically, the watch won’t have a true circular display, which might be a bit frustrating for some users, especially if you opt for a brighter watch face. Otherwise, we must admit that overall, the smartwatch looks very good. The black leather bracelet offers a very elegant touch, making it a nice option for those moments when you want to opt for a more formal outfit, but you can’t leave your smartwatch at home. Also, it seems that the new Moto 360 will be available in a Rose Gold casing-Cognac band color combination. Nothing about an official release date for the moment, but this should happen relatively soon, considering that these employees are already using the smartwatch. Any first impressions about the new Moto 360’s design?